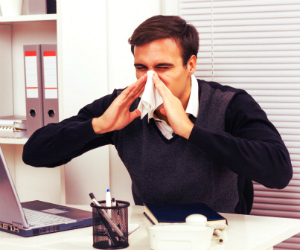 Being sick is bad enough, but coming into work while under the weather can be miserable. This week President Obama proposed a plan to provide millions of US workers the chance to earn up to seven days per year of sick time. While many Americans are eligible for paid sick leave from their employers, the White House estimates that 43 million American workers receive no sick leave at all. In a landmark study published in the Journal of Occupational Health Psychology, psychological scientist Gary Johns of Concordia University in Montreal found evidence that coming into work while ill—called “presenteeism”—may not be the best option for workers or businesses. His research suggests that when workers show up sick, organizations can take a major hit in the form of lost productivity. Employers have traditionally examined ways to curb days out of the office, but have paid little attention to presenteeism. The true costs of presenteeism are difficult to estimate, but a 2012 study from the Integrated Benefits Institute–which represents many major US employers and business coalitions—appraised the cost for presenteeism as up to $227 billion a year in costs to the economy. For his study, Johns surveyed 444 business school graduates employed in a variety of occupations on several job factors. Using a 5-point scale, participants were asked to rate items such as how their absence on the job would affect colleagues, how they felt about work absences (i.e., “Absence from work is a legitimate work behavior”), and how satisfied and secure they felt about their jobs. Productivity loss was measured using two self-report scales asking respondents to report whether their health interfered with their ability to properly carry out their job responsibilities. Johns found that a number of factors contributed to the decision to stay home or come in sick, including a lack of job security, impermanent employment, and, for those working in teams, not wanting feel like they let their colleagues down. Respondents who viewed absenteeism as more legitimate reported taking more time off, more sick days and fewer low-productivity presenteeism days. Johns cautions that results could be skewed due to the relatively young age of the sample size as well as the fact that all of the respondents were MBA graduates. Additionally, measures such as productivity can be difficult to quantify, particularly across a range of occupations.